With campuses as big as Memorial’s, it’s easy to get lost sometimes. That’s why Memorial University has launched new, interactive campus maps now available on mun.ca. The campus maps feature 3D renderings of the St. John’s, Grenfell and Marine Institute campuses on one easy-to-use platform. Users can customize their view and refine their search with information categories like parking, transit, wheelchair accessibility, student services, event details, on-campus construction and more. 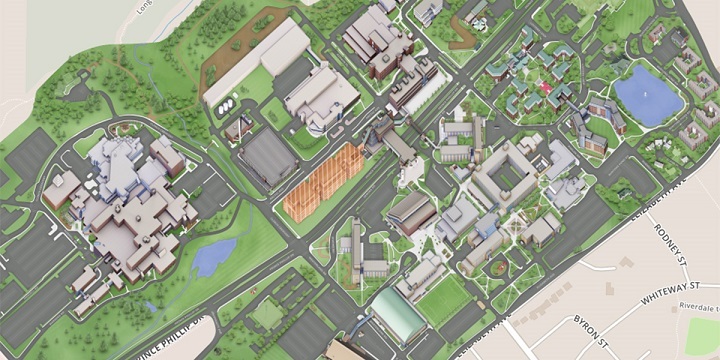 The map provides point-to-point directions within the campus, as well as destinations throughout the city. For added convenience, the new map offers a customizable print option. As technology continues to evolve, it’s important to keep up with the ever-changing trends that appeal to today’s students. Memorial’s previous campus maps were outdated and lacking in functionality. With the assistance of CampusBird, a company specializing in map management systems for higher education institutions, the Division of Marketing and Communications worked with multiple units throughout the university to create the new maps. A key goal was to create a mobile-friendly tool to allow users to navigate campuses. The new map tool replaces three separate maps and websites, creating one unified navigation tool for three campuses. Providing a new true-to-life perspective, the map increases campus accessibility and information access for students, faculty, staff and visitors while aiding in the recruitment process for potential students. To find your way, check out the new Memorial University campus maps here.